It’s fairly evident that we’re a selfish bunch — developing technologies that help us live as fast and hard as possible, spending money on products that will prolong pleasure if not life itself (though that’s also a heavily financed desperate pursuit), mining foreign lands for all they’re worth, all with relatively little regard for the long term consequences. And what are those consequences? Well we’re living in the thick of them — global warming, catastrophic pollution, rising sea levels and the interminable growth of the human population. This has all been said before — but to what effect? It’s something of a rhetorical question, knowing what we do about the lack of progressive change in the grand planetary scheme of things. But it remains a critical question — one that the organisers of the In Between Time Festival are encouraging people in Bristol and beyond to ask, in a pioneering, innovative approach to celebrating “eccentricity, excellence, beauty, love and community with a spirit of adventure that is truly, urgently alive”. Coinciding with the city’s designation as European Green Capital, this year’s festival is a commendable effort to prompt engagement and understanding about about environmental uncertainty. Taking stormy weather as its theme, the festival launched with the opening of Fog Bridge, a ten-day installation by Japanese artist Fujiko Nakaya. 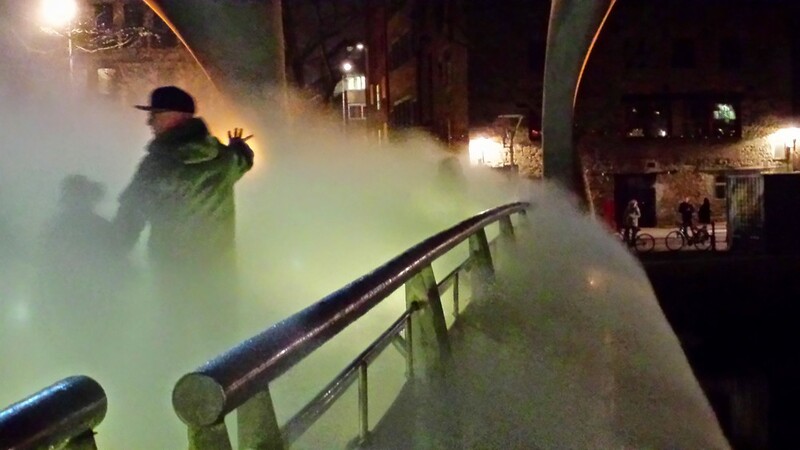 Along Pero’s Bridge, passers by are encouraged to pause and “take a step into the unknown” as they are momentarily immersed in clouds created by water that is pumped through micro-fine sprinklers off the side of the bridge. The idea is a vital demonstration of the power of art to produce a compelling narrative in a unique way, particularly with regards to complex issues such as climate change, where the political and scientific tone of the debate can cause many to disengage. Nakaya’s aim seems to be to engage people in a macroscopic enactment of a global crisis, artificially disrupting the weather so as to make it undeniably real. But how much do people emerge from this fog with a sense of what it all means? How likely are they to pause and contemplate long enough to instigate the level of behavioural change that is required to slap the anthropogenic helping hand of Earth’s demise. Judging by the footfall when I witnessed the installation in action on several instances, most people simply walked on through, marvelling at the sensation of being immersed in mist, momentarily captivated by the extraordinary nature of the experience. And then they moved on with their lives. Predictably, some stopped to take a selfie, besides the padlocks that have also overtaken the bridge, a supposed symbol of love. Rather than engaging with the idea as well as the execution, Fog Bridge seemed only to foster an aesthetic, experiential response. And there’s nothing wrong with that of course, it’s art after all. But where art claims to have a more meaningful intention, surely that intention should be realised in the act? Of course I’ve no quantitative or qualitative data to back up this fatalistic conclusion, merely observation. It’s not at all scientific. What is scientific is the data and analysis that pretty much tells us that as a species and a planet, we’re doomed. We’ve tipped the equilibrium of the biosphere so far that the beauty has all but been betrayed. However, we still have a responsibility and should act within the full capacity of our knowledge rather than eek out every ounce of this planet’s resources to the point of premature destruction. In Between Time and Fog Bridge are both noble and much needed markers in humanity’s engagement with the urgent issues that face our existence. In visiting Fog Bridge, I had hoped to see people mesmerised by the aesthetics and subsequently moved by the ideal — action and reaction. Will we emerge from these shadows, can knowledge save us? Time will tell when the storm passes.